Rawdon Roofing Construction Services undertake all aspects of roofing repairs including; renovation, slating, tiling, felt repair and replacement, guttering, lead work, pointing and moss removal, which not only makes your property more attractive, but also it prolongs the lifespan of your roof. Moss retains moisture which may damage the roof covering, particularly if left on the roof in frosty weather, careful removal is advisable and treatments are available to eliminate this problem with a roof coating solution. 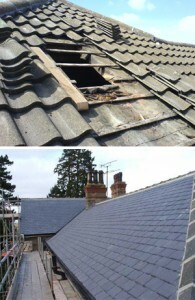 Many roof coverings such as lead or thatch require specialist repair. Do not use unskilled labour or quick-fix materials as these could cause greater long-term damage and greater expense.